Q. I am a job CED coater. Recently a Zinc plated job has come to me for coating. After coating, all jobs were rejected due to PIN HOLE problem. A. CED Can be done on hexavalent yellow passivated part. If it is as plated or trivalent passivated, carry out tricationic phosphating then go for CED Coating. Q. By phosphating Zn plated part in my bath will lead to increase in Zn content in it. Won't that matter? A. Maybe it's the angle from which the photo was taken... but I can't see a weir to remove the surface foam being produced by the coating process? A. Bubble on top of coat bath. You need a weir box to roll the top of the tank to. You also need to determine where the air bubbles are coming from. A. Bubbles can be produced by cavitation in the main tanks pumping system. b)The rpm of the internal mixing system (normally a stirrer) is too fast. c)Blades of stirrer are too low. Q. The foam issue is already resolved, mainly due to circulation pump choked by some cleaning cloth. However, the problem I'm facing is some pinholes due to gassing at bottom surface of raw parts. Parameter of ED in spec; just pH slightly acidic (pH 4.5 - 5.0). What I'm curious is just whether tank either circulation is not enough or maybe in tank setting something has been neglected...Maybe I'm wrong, kindly advise any eval'n that I can find out more. A. Most important to avoid pitting at the bottom - clearance of work piece to bottom sparge pipes should be minimum 200 mm! I once had the opportunity to look at an ED film ( 40 X I think) before the curing process and 'lo and behold ', they were full of pin holes! It is only through the curing process, the higher temperature makes the film more 'fluid', those pin holes were closed up, so to speak. It may be possible, your pin holes problem are curing oven related rather than ED tank related?? A. First ensure that all the bath parameters are within specification and pH meter, Current-voltage meters are working properly. Pinholes at the bottom of tank may be due to excessive gassing, i.e., due to high current density which further may be due to high solids content or suspended particles or too low pH. Also, get solvent content tested by your paint supplier. A. Check your solvent (BC) content. If it is on higher side it will definitely create pin holes. Check also ramp up time for rectifier voltage. A. Kindly provide details of the pre-treatment process that is done prior to E-coat. Have you checked the component after pre treatment and before E-coat for presence of oil on its surface? Thanks for your advice. I already went through all recommendations but it was not root cause. Thereafter, I changed existing circulation pump from Vertical to horizontal centrifugal type. Surprisingly, it resolved all those pin hole defects. Anyway, thanks for ideas from all. Q. We have pinholes after applying the electrodeposition coat. We think we have a problem in the activation process in pretreatment line. Please guide me. Q. How to Solve Pin holes in CED paint plant. Please give detailed answer. A. Hi Ashena, hi Senthil. As you see, we appended your inquiries to a thread which already addresses this issue and may solve your problem. If not, please give the details of your situation. Thanks! I am working as an Automotive CED Paint plant. In our plant daily pinhole, crater and white dot issues observed after oven; every day more rejections -- all parameters are within spec. So please give some ideas to resolve this issue. Q. I am working as line chemist of PT [pretreatment] and CED line. I got some problems after maintaining PT line. Sir please see and tell what is the problem and resolution. 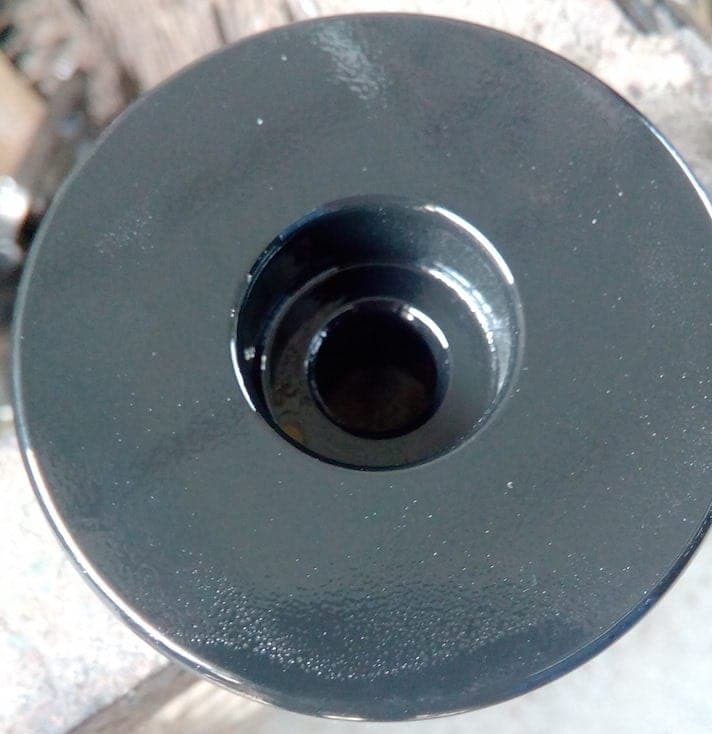 In this company we do coating of PT and CED on tractor spare parts. 1. Tried on other substrates or materials? same defect appeared? 2. Any solvent/oil floating on bath surface during ED process? 3. Ensure no stubborn oil & grease on part surface? 4. After rework process part proceed to ED happened same defect? Above questions might lead you to certain idea to proceed. A. The problem is in the bath composition; you have to add hydrogen scavenger to the bath like nitroethane or hydrogen peroxide in the ratio 4% -- this is because hydrogen evolves during the process making film defects and the surface of the work piece not fully painted which causes free zones that makes rust and pits in the film so you have to eliminate defects by hydrogen scavenger. Q. Please tell me how eliminate the problem of pinhole on bars please tell me. A. Hi Ganesh. We appended your inquiry to a thread with lots of great info on the subject. Please review it, then expand upon your question with details if this thread doesn't solve it for you. Good luck. I am working in a HDD manufacturing company in Cambodia; I am the e-coating manager. Here we are facing very high fallout of hard blisters, soft blisters and pin hole voids (fish eye). The pre treatment is a very mild etching process. Please advise me how can I solve this problem. I am employee of CED coating system in johor malaysia. Now I have some problem on my ED coating part surface. My ED bath pH - 5.7, NV%-10.00, PB ratio - 0.095, bath temp. 25.0 °C. BC % - 1.25, HC % - 0.890. The part before Ed I have been 100% confirm free from oil. but there is still pin hole defect ... but just one dot only. So how I can solve it? Please give me the some idea or advice. you cooperation will be high appreciated. Q. How significant is it to drain permeate? Here where I'm working, no one drains it even a bit. And we frequently face the problem of pin holes on Cathodic electro deposited automobile bodies. My senior says it's due to high MEQ. Please shed some light on this for me. I am employee of the CED Coating system in chennai india. I have some problems on my CED coating pin hole issue getting on only bottom and curve of the components for all components where ever jigging. All the parameters are with in speck and having sufficient agitation. Kindly guide me to resolve this issue and explain the root causes and action plan sir we tried all trials as far as we know in all aspects. Please find attached photos for your reference. Q. I am working in a e-coating plant Bangalore. Our pretreatment line is OK, but pinhole is coming in component. What shall we do? Please guide me? To avoid this problem ... then install filtration method in ED bath.